Thank you to everyone who came out to last week’s ag breakfast co-hosted with Sen. Gene Yaw. I especially enjoyed the opportunity to meet with area FFA students. They are truly outstanding young people who will help lead our communities and our Commonwealth in the future. Thank you to the kids who participate and to the parents and teachers who support them. 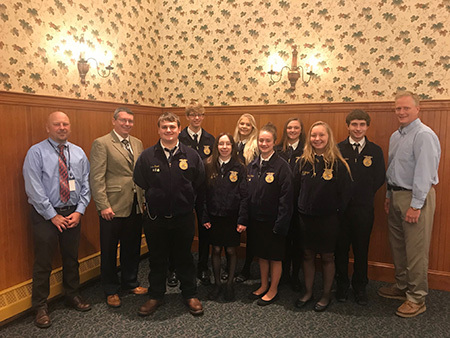 Teacher Jarod Armstrong (far left), Department of Environmental Protection (DEP) Secretary Patrick McDonnell and I are pictured with Mifflinburg FFA students. 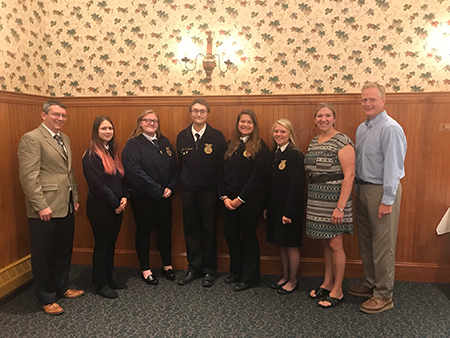 Teacher Valerie Fry (to my right), DEP Secretary McDonnell and I are pictured with Selinsgrove FFA students. 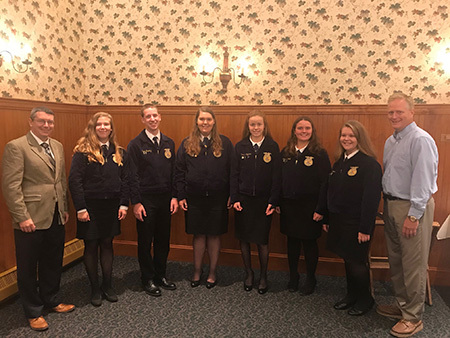 DEP Secretary McDonnell and I are pictured with Midd-West FFA students. The Department of Conservation and Natural Resources (DCNR) is offering free, in-person grant workshops at six locations across Pennsylvania this fall, including State College, in preparation for the 2019 Community Conservation Grant Program which will open on Jan. 22, 2019, and close April 10. These workshops will provide technical assistance to potential applicants on DCNR grants available for recreation, conservation, riparian forest buffer, trail and community-based projects. Attendees will have the opportunity to interact with staff and receive information on grant program selection criteria, eligible applicants and projects, and documents required for various types of applications. Community leaders, municipal officials, consultants, land trusts, volunteer board members, trail managers, and park and recreation professionals are encouraged to participate. The session in State College is scheduled for Wednesday, Nov. 7, from 9 a.m. to noon at the Unitarian Universalist Fellowship of Centre County, 780 Waupelani Drive Ext., State College. Pre-registration is required for the workshops. To learn more, click here. The Pennsylvania chapter of the National Federation of Independent Business (NFIB) presented me with a Guardian of Small Business Award in Harrisburg this week. The award is based on lawmakers’ support of key small business issues in the current session of the General Assembly. 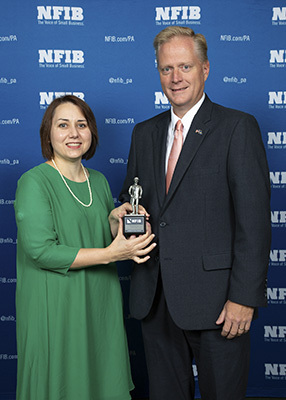 I am pictured with NFIB’s Legislative Director in Pennsylvania, Rebecca Oyler. Mifflinburg Oktoberfest: Friday and Saturday, Oct. 5-6 at the Mifflinburg VFW Fairgrounds. German music and dancers, festival and German foods, imported beer from Germany, and German style wines. Click here for additional information. Buffalo Valley Antique Machinery Association Annual Autumn Exhibit: Friday through Sunday, Oct. 5-7. Displays and demonstrations of the use of antique tractors and machinery. Antique tractor pulls, garden tractor pulls and a kid’s pedal pull. Food, crafters, a small flea market and an apple butter boil. A church service and camping is available (no hook-ups). Click here for additional information. Lewisburg Children’s Museum Activities: Weekends in October. Stop by for story time (Oct. 6); learn about wooly worms (Oct. 13), forests (Oct. 20) and chemistry (Oct. 27); or take part in “Munchkins and Pumpkins,” featuring a variety of fall activities (Oct. 28). Click here for additional information. Fremont Apple Harvest Festival: Friday and Saturday, Oct. 12-13. Food stands, vendors, old country store, baked goods wheel, Chinese auction tickets, barrel train rides, bounce houses, kids zone and more! Click here for additional information. Selinsgrove Halloween Parade: Tuesday, Oct. 16, 7 p.m. (Rain date is Oct. 17). Selinsgrove Projects Inc. will host a Halloween Parade in downtown Selinsgrove. Pre-register by Oct. 12. Click here to register and for additional information. Halloween Costume Judging: – Saturday, Oct. 20. Registration starts at 11 a.m. at the Arts Council table on Selinsgrove Commons. Every child gets a treat, and the first 40 signing up get free mini-pumpkins courtesy of Selinsgrove Farmers Market. Judging begins at noon on the Commons. Costumes will be judged in two age categories: infant-kindergarten and grades 1-5. Six monetary prizes will be awarded. Volunteers from the Regional Engagement Center (REC) will offer a kids’ activities area. Click here for additional information. McClure Bacon Fest: Saturday, Oct. 27, 9 a.m. to 3 p.m. Arts and crafts vendors, local farm vendors, direct sales vendors and lots of bacon themed items! This year’s event also includes a Chasin’ Bacon 5K Run/Walk! Click here for additional information. 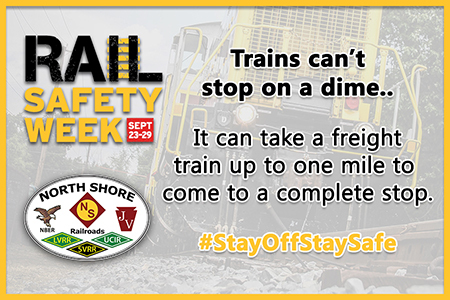 With Rail Safety Week drawing to a close Saturday, Sept. 29, the North Shore Railroad Company & Affiliates has been spreading the word about railroad safety. Did you know that railroad tracks, yards, bridges, etc. are private property? Using them for hiking, photography or anything without proper permission is not just dangerous, it is illegal. An optical illusion makes it hard to determine a train’s distance from you and its speed. You cannot hear all trains approaching. According to Operation Lifesaver, Inc., a nonprofit group dedicated to educating about rail safety, every three hours a person or vehicle is hit by a train. They also report that the impact of a car to a soda can is the equivalent of the impact of a train to a car. Please spread the word about railroad safety, and remember to stay off the tracks and stay safe! The Federal Emergency Management Agency (FEMA) is in the process of issuing updated Flood Insurance Rate Maps for areas across the country, including Snyder and Union counties. By law, FEMA is required to review community flood maps because flood risk can change over time, and the maps help communities make decisions about building codes and other standards that help make residents, homes and businesses safer from flooding. According to the September monthly update on flood mapping provide by FEMA, preliminary maps for our region will be released this fall, with community meetings to discuss the maps coming later this year or early next year.